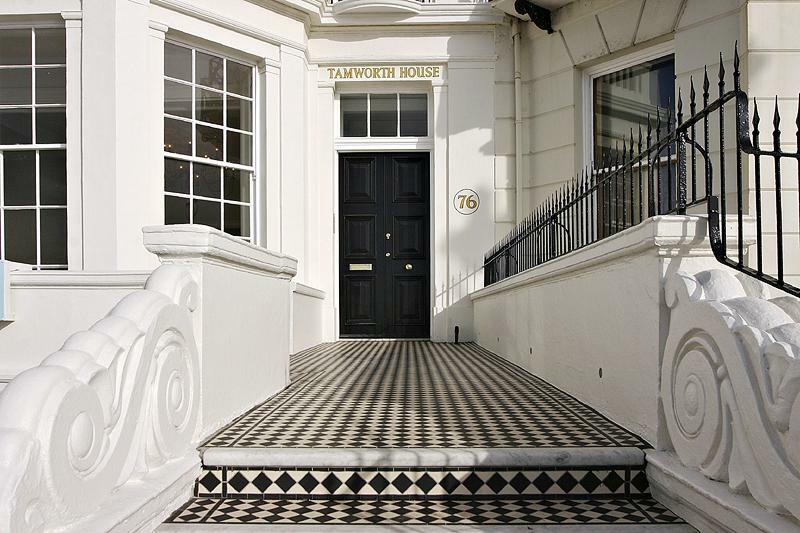 76 Marine Parade is a Grade II Listed bright-white stuccoed Regency townhouse on the glorious Kemp Town seafront. 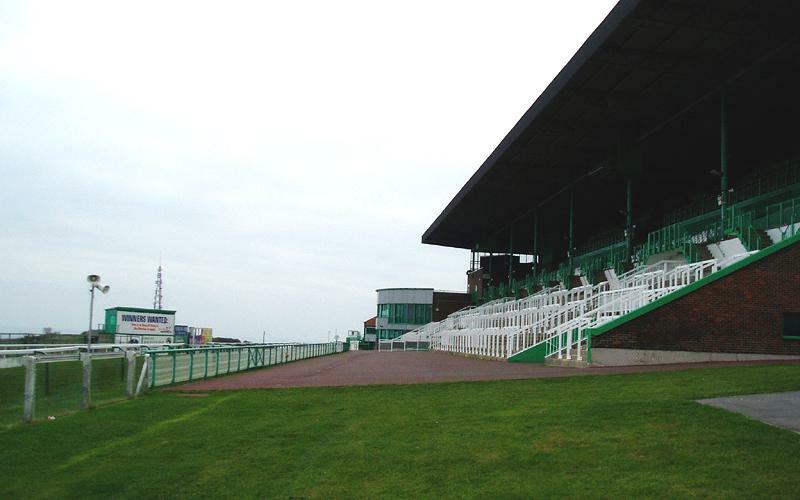 Marine Parade was extensively developed from 1790 and Tamworth House, to give No. 76 its restored name, is a particularly fine example of the period. 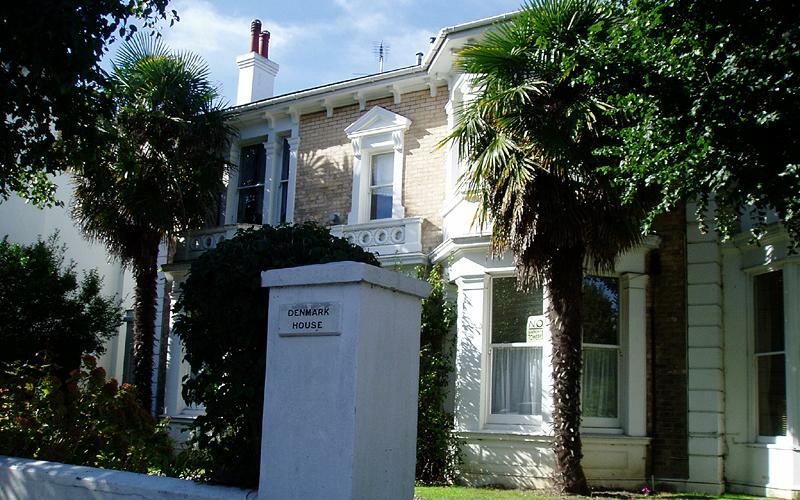 Tamworth House is thought to have been built in the 1820s by Charles Barry (later Sir Charles) who went on to build the Houses of Parliament in London and St Peter’s Church in Brighton. The Royal British Legion owned the building from the 1930s until 2004 when sympathetic developer, Doug Pearch, snapped it up following sealed bids. He quickly ripped out all of the non-original features and began the detailed restoration work that a building of this quality deserves. With high celings, Italian kitchens and views over three piers (Palace, West and Worthing) and the Marina, the overall effect is one of absolute luxury. The property appears to have four storeys but on closer inspection has six including rooms in the mansard roof and also a sub-basement below the main basement which leads to the building’s most talked-about feature – the tunnel. A small hole was the clue which led to the discovery and excavation of a massive tunnel running all the way down to the beach. Once concrete, rubble and general junk were cleared it was clear that something special had been unearthed. The picture speaks for itself really. The lucky owners of the building’s six flats will have private access to the tunnel. Another famous local tunnel of the same period is that which runs from the locked communal gardens in Lewes Crescent down to the lower promenade. 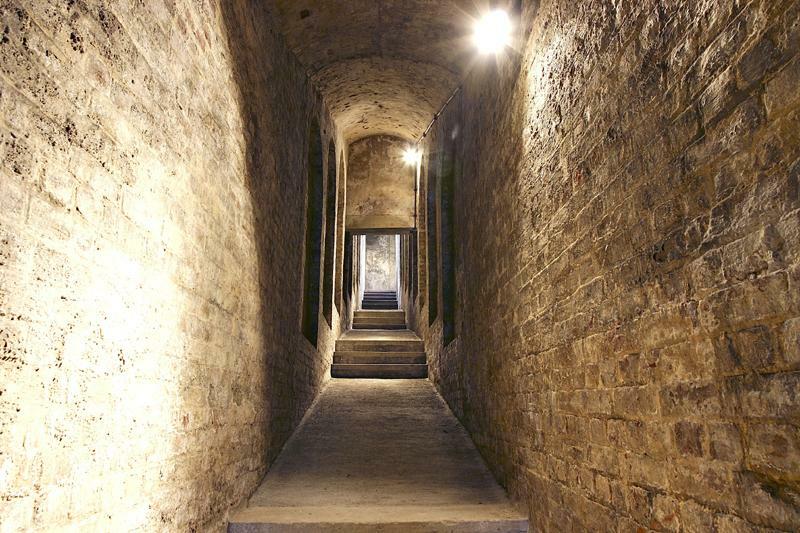 Several other less famous tunnels exist off Sussex Square. Around that time, the Prince Regent built a tunnel running from the Pavilion to the Dome to keep out of site for various reasons. 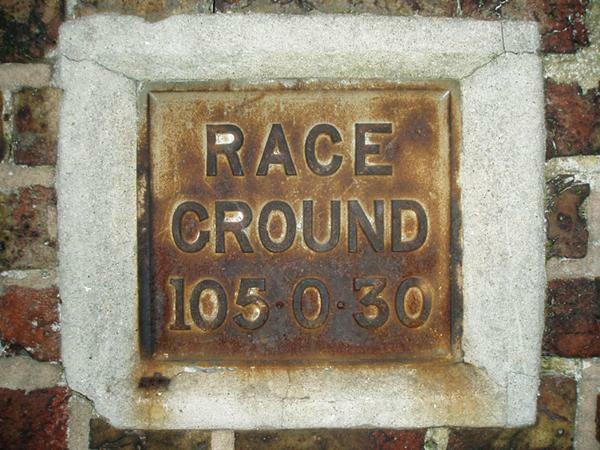 Not so well known is the tunnel running from St. Andrew’s Church in Hove to the pub opposite! Although of a much later period, the extensive Second World War military tunnel network below the hills of South Heighton by Newhaven are by far the most impressive in terms of depth, length and secrecy, but that’s another story. Fox & Sons are selling the flats (or apartments as Doug calls them) from £250,000 to £700,000 which just goes to show that if you want a tunnel of your own, you must be prepared to dig deep. 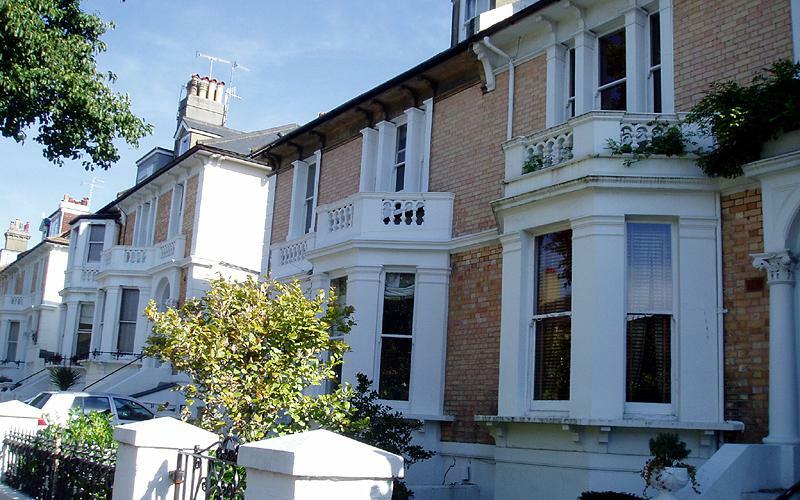 Of all the tree-lined streets and grand boulevards of Hove, there is one that captures best the Victorian spirit that many of the others have lost. Running from Blatchington Road to Hove Station, Denmark Villas with its tall elms and sycamores has retained its character from all those years back. The west side of the street has a tall terrace of houses at the top and one at the bottom but it is the villas that make it special. They are all semi-detached except numbers 47 and 49, which are detached. No. 49, or Denmark House as it’s also known, has a particularly fascinating history and was once owned by Nicholas van Hoogstraten. In 1983, the property tycoon claimed that ‘anarchists’ tried to blow it up. Rather than rely on hearsay I asked him about it. He told me that the building was found empty except for a lit candle alongside a sawn-off gas main! He also blames the culprit for fires at a property of his on Cromwell Road and also at the original building Victorian manoe on his High Cross Estate in Uckfield. This is at least a better explanation than that of the cigarette-dropping seagull that apparently burnt down the West Pier (twice)! At the top is Ralli Hall, the road’s only Listed Building (Grade II). This red-brick community centre was built in 1913 by the Ralli family to perpetuate the memory of Stephen Ralli, who made his fortune in grain. On the east side, numbers 2 and 4 are missing. Instead, there is Granville Court, an ugly modern block. After this monstrosity, there are more villas, this time built with a beautiful peachy yellow brick which I imagine is particularly hard to replace. There is a pretty terrace of houses above this which is unfortunately followed by a nasty row of shops, which was built on the site of an old cinema. At the top is Hove Station, which opened in 1893. One of Hove’s newest roads, “Robbie’s Approach” was recently created in front of the station to deal with the queues to the hand car wash, owned by local businessman, Robbie Raggio. Over the years, residents have clearly fought hard to keep Denmark Villas’ unique character in place. This wonderful conservation area is an excellent example of what can be achieved when a general architectural principle is adhered to; in this case yellow-bricked Italianate villas. To the west is the Stanford Estate of First to Fourth Avenues; to the east, Adelaide Crecent; and to the south, the calming Hove Lawns. 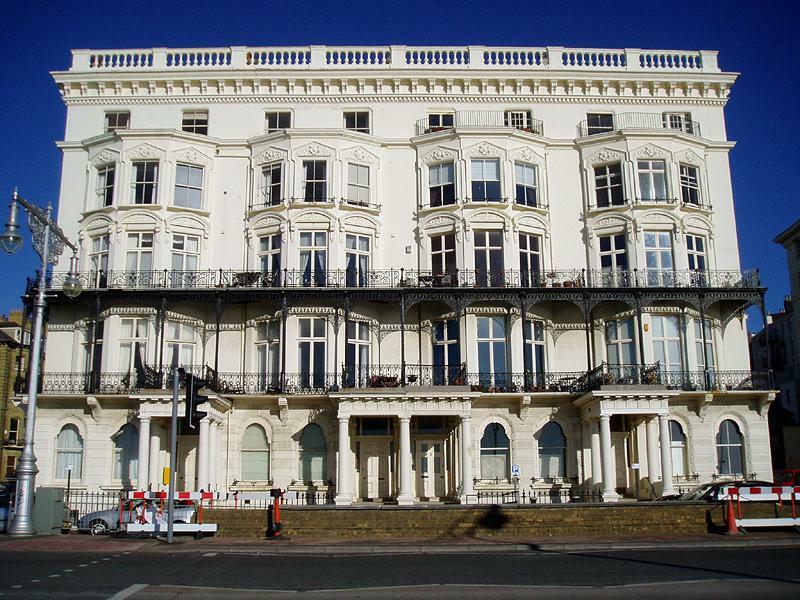 Adelaide Mansions is a symmetrical block of just four grand houses on Hove’s historic seafront. The neighbouring Grade II* Listed Adelaide Crescent was built by London architect Decimus Burton from 1830-50 for Sir Isaac Lyon Goldsmid. The Grade II Listed Mansions, similar at a glance to the Crescent, followed in 1873 to the designs of prolific local architect, Thomas Lainson. Lainson was also responsible for the Middle Street Synagogue, the Royal Alexandra Hospital, Norfolk Terrace and New Church Road. Adelaide Mansions and Crescent are both terraces of tall, gleaming white townhouses, but on closer inspection, the Mansions are far more ornately adorned with every detail imaginable. 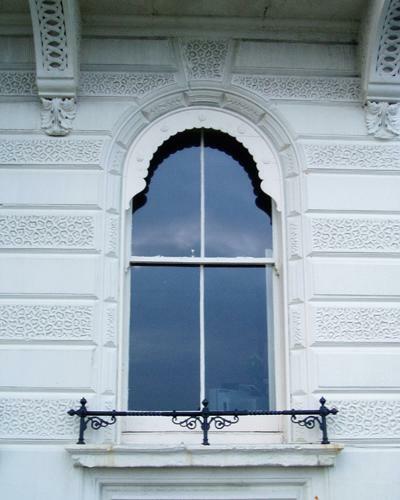 There are a number of different mouldings above the large windows and an intricate iron balcony with stunning sea-views runs across the width of the second floor. Each of the four Mansions has five generously-proportioned storeys and a basement. A balustrade parapet hides the pitched roof. Numbers 1 & 2 Adelaide Mansions were combined many years ago into a single building and converted into luxury apartments. The staircase has been removed from No. 2 and the void absorbed, as new rooms, into the surrounding flats. This transformation has led to some exciting layouts with winding passages, staggered floors and hidden annexes. In places, it is very hard to work out what is original and what is new due to the sympathy of the conversion. Numbers 3 & 4 have also been combined to form a single building but were originally converted into the Lawns Hotel, not flats, in 1918. In the Hove Official Guide 1937-8, the hotel was ‘noted for its quiet comfort and excellent cuisine’. The hotel had around 25 permanent residents by the 1970s. The bar was refurbished in 1990 to become the Zipadeedodah Bar and, that same year, the First Avenue Restaurant opened on the premises. The venture was not a success. By 2001, Numbers 3 & 4 had been completely converted into flats which meant that the entire Adelaide Mansions block had become private apartments. It’s a great shame that the block’s namesake, William IV’s wife, Queen Adelaide, died 24 years before it was built. I’m sure that she would have agreed that this fine development is worthy of the use of her great name.